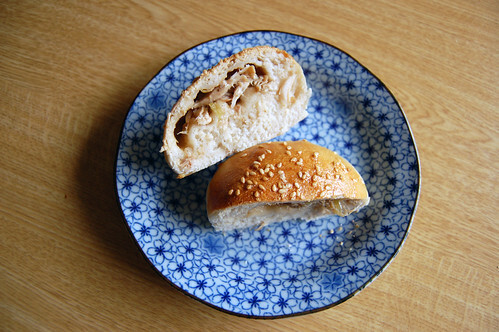 This recipe is an adaptation of the hoisin chicken buns recipe from Cooking Light, by way of Cooking Cute. To make this recipe, you first need a batch of white bread dough (for rolls) – you can either find fresh dough in the chiller cabinet of larger supermarkets (make sure it’s just plain old white bread dough, not focaccia or anything fancy like that! ), or you can make a batch in your bread maker. This part is a faff, but the finished product is such an interesting and unusual way of using up leftover chicken, that I think it’s worth going to a little bit of extra effort – plus, these are portable, and perfect for lunches on the go! Shred the chicken, and mix with the rest of the ingredients. 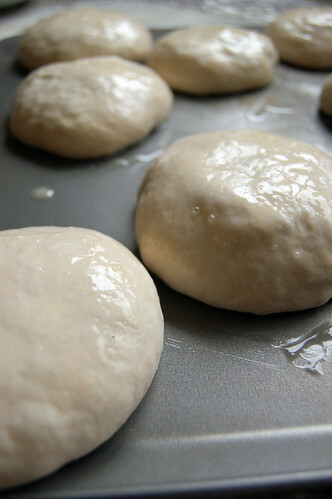 Once you’ve made your dough, turn it out and cut it into eight pieces, and roll each piece into a size slightly bigger than your palm. 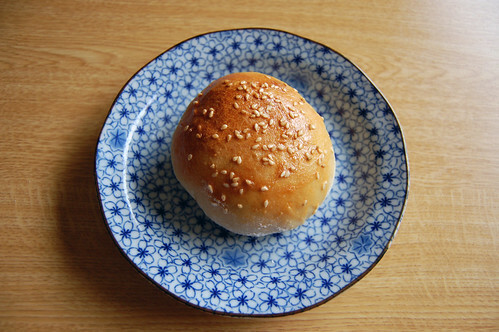 Place a spoonful of the chicken mix into the middle of the bun. Set it on an oiled tray and put the rest together. Cover and allow to prove for 20 mins in a warm place. 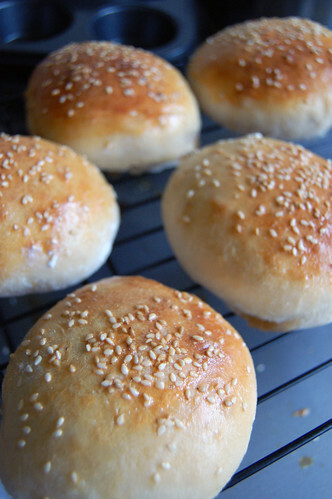 Preheat your oven to 190C and then brush the buns with beaten egg and sprinkle with sesame seeds. Allow to cool slighty, then eat! Make some Thanksgiving fondant pumpkins for your cakes this Turkey Day! They’re definitely worth a try – they’re really nice picnic food (although, not really picnic season here, right?!). The hardest thing is getting the bread dough together, but you can buy that Pilsbury canned stuff in the fridge sections now – so handy!